Authorities have closed the main route between Las Vegas and Phoenix due to heavy snow that has resulted in a 22-mile line of cars and trucks. The Nevada Department of Transportation reported Thursday that nearly 80 miles of Interstate 11 and U.S. 93 from Boulder City to Kingman, Arizona, was closed. Officials suggested motorists use U.S. Highway 95 as an alternate between Boulder City and Interstate 40 near Needles, California. In the Las Vegas area, motorists are being warned about the possibility of icy road conditions into Friday. Officials say overnight temperatures below freezing could create dangerous black ice conditions for drivers. The National Weather Service in Las Vegas reported a half-inch (1.3 centimeters) of snow at McCarran International Airport and 7 inches (17.8 centimeters) in western parts of the Las Vegas valley. 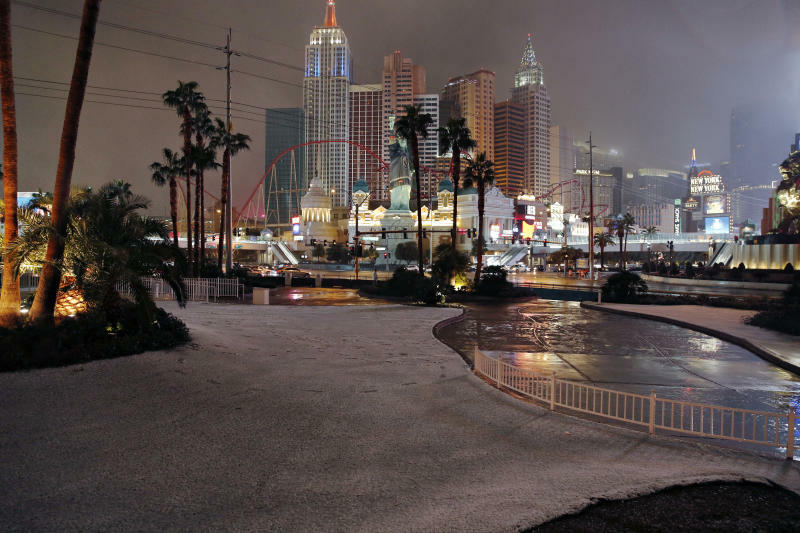 It was the first measurable snowfall on the Las Vegas Strip in a decade. McCarran International Airport in Las Vegas is reporting flight delays of more than two hours and some cancellations due to snow and icy runways. Airport spokeswoman Christine Crews said Thursday that more than 100 flights have been affected. Meteorologist Chris Outler says a half-inch (1.3 centimeters) of snow was recorded overnight at the official regional weather station at the airport, which has no snowplows. It was the first measurable snow at the airport in 10 years, but much less than the 3.6 inches (9.1 centimeters) recorded on Dec. 17, 2008. Outler says there won't be enough snow to build snowmen at the "Welcome to Las Vegas" sign. But some suburban foothill areas have several inches. Las Vegas is getting a rare taste of winter weather, with significant snowfall across the metro area. 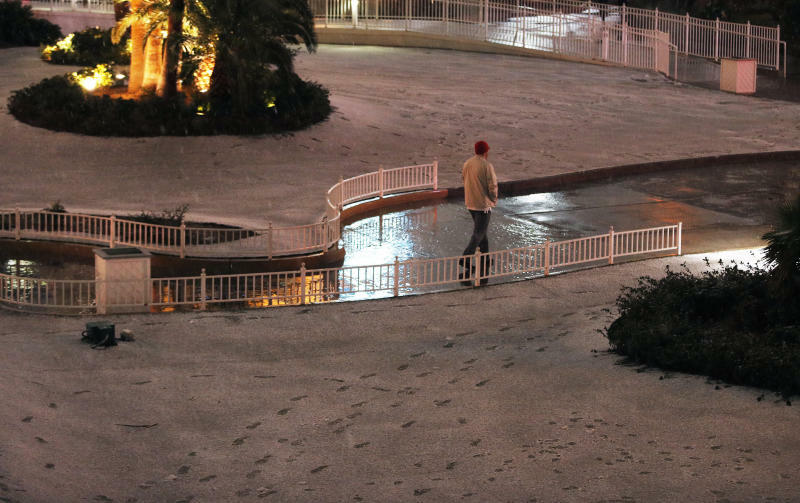 It began snowing late Wednesday with the National Weather Service reporting 1 inch (2.5 centimeters) of snow at McCarran International Airport as of 4 a.m. Thursday. 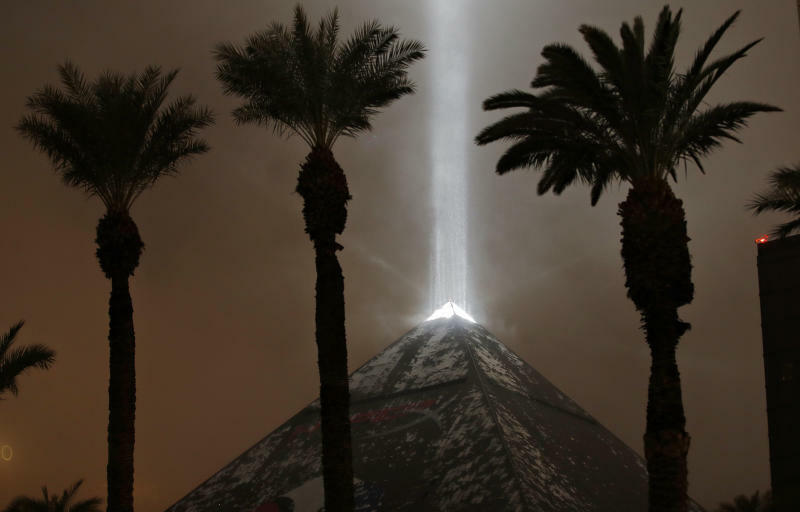 The weather service said Las Vegas' 0.5 inch (1.3 centimeters) of snow Wednesday was the first occurrence of measurable snow for a Feb. 20 since record-keeping began in 1937. Las Vegas schools remained open Thursday and the Nevada Highway Patrol said some areas had snow and ice but all freeways were open for traffic. The weather service said total snow accumulations could reach 3 inches on the city's western and southern outskirts by Friday, though forecasters say rain could reduce snow accumulations.